Two miles east of N.H. Route 12A on Town House Road in Cornish over Mill Brook. The bridge is 91'0" long with a clear span of 76'4". It has an overall width of 14'3" with a roadway width of 11'5" and a maximum vertical clearance of 9'3". It is closed to vehicular traffic. The Blacksmith Shop Bridge was built by James Tasker. The bridge was used by only one family and given its name because of its close proximity to a local blacksmith shop that once stood in an area know as Slab City. Milton Graton repaired and restored the bridge in 1963. The southern end was raised two feet and the northern end one foot. The floor and sheathing were replaced. The bridge was reopened to pedestrian traffic only and dedicated on September 18, 1983. Tasker's great-grandnephew (from Connecticut) attended the opening. 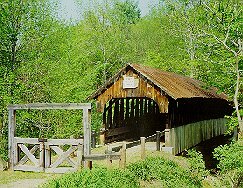 The cost of repairing the bridge, in combination with the Dingleton Hill covered bridge, was $30,000. The restoration of both bridges was made possible with aid from a federal Historic Preservation Fund matching grant from the National Park Service of the U.S. Department of the Interior through the New Hampshire Division of Historical Resources, the Putnam Foundation, the Cecil Howard Charitable Trust, the Eva Gebhard-Gourgaud Foundation, and the Town of Cornish. It is also known as the Kenyon Hill Bridge. The Blacksmith Shop Bridge is listed on the National Register of Historic Places.